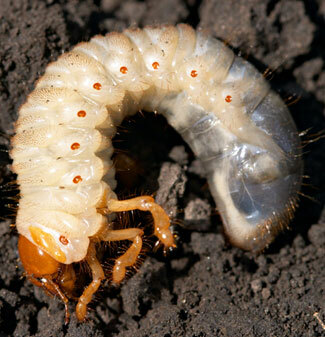 GRUBS are the larval (worm) stage of beetles. Beetles lay eggs in the lawn in mid to late summer. Newly hatched worms feed on roots of grass plants. The most damage occurs during the fall. When the temperatures drop, grubs burrow deep into the soil for the winter. As the soil warms in the spring, they return to feed again. After this spring feeding, the grubs pupate into adult beetles and the cycle begins again. Don't Delay - Grubs will not disappear without treatment. When discovered early enough a preventative treatment can be applied. After damage appears in fall, a fast acting curative treatment is needed. Moles - Grubs are a good food source for moles. If you are seeing evidence of mole activity in your lawn, such as tunnels, you may need to treat for grubs.